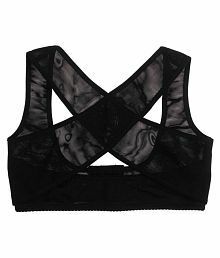 Women Stretchable Breast Push Up Brace Bra & Back Support, Posture Corrector, CorsetÃ‚Â Belt (L, Black)@619 Rs [Mrp:-619] - Onlinedeals.discount - A leading product discovery website. Find the true prices of products, read reviews and buy top brand products at reasonable prices. Material: 85%Nylon+15%Polyurethane, Color – Black/Beige. Size – L is suitable for under bust girth which is approx.80-85 cm(31.4-33.4 inch), Bra in size 36B/C/D and 38A/B. Non Returnable As the product comes in intimate wear.